Grieving over the loss of the heart dog is a very personal and private process, and I can't say I have any answers on how to cope. 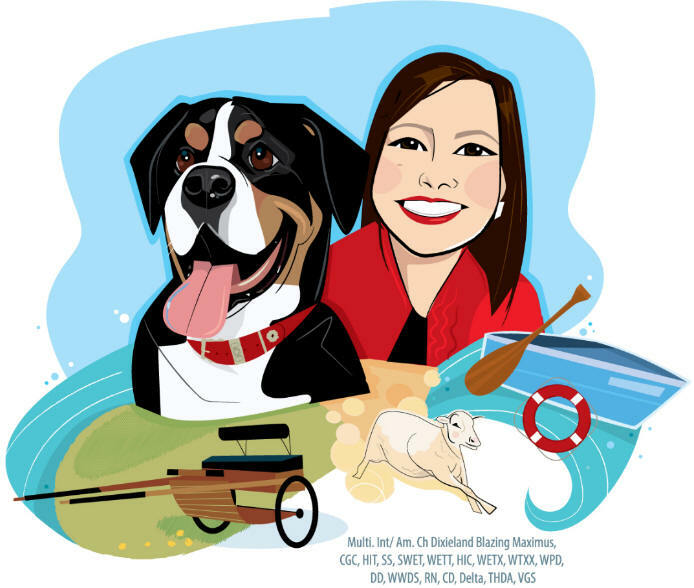 I do have some resources and ideas on how to commemorate the life of your heart dog. 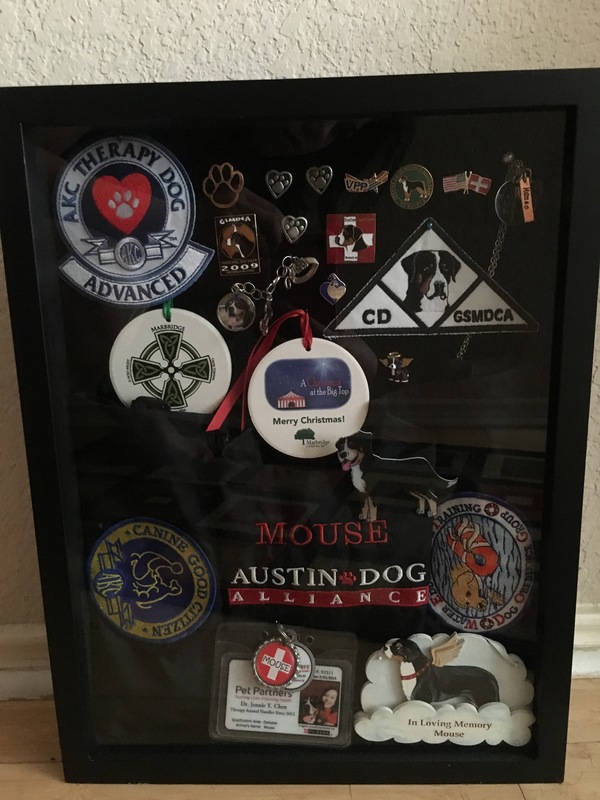 Cremation services in Austin, TX - I used Mission Pet Memorials located in East Austin. Before I needed their services, I called several pet cremation providers without much luck, except with Mission. My calls were answered promptly and with care. Communication on the process was on perfect, and I felt that my dog was being cared for with dignity and respect. Additionally, Mission Pet Memorials provides complimentary services to dogs who were served their community. This can be in the form of a military dog, police dog, search and rescue dog, service dog, or therapy dog. Please do check to see if your dog's service qualifies first. 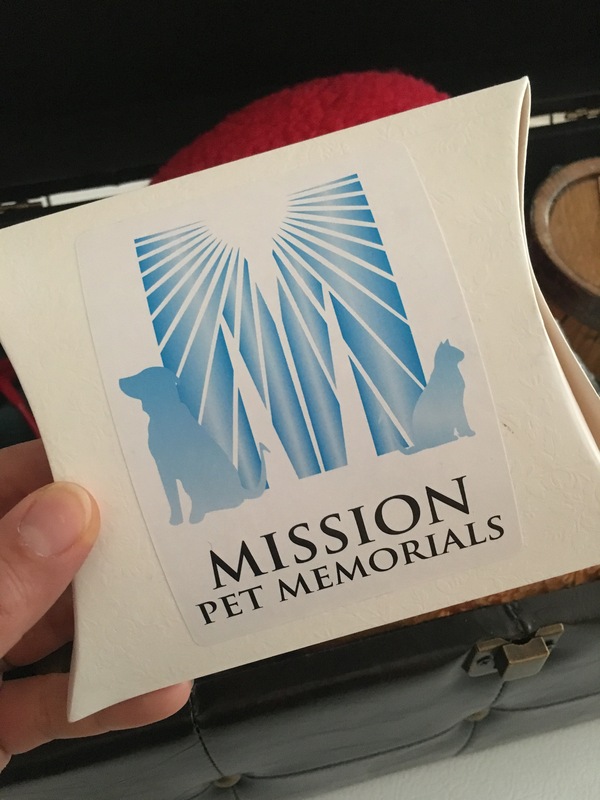 Not did Mission Pet Memorials provide great service to my pet, it was a process that made me feel like my dog was cherished. While many people might enjoy the convenience of having the veterinary clinic handle it, I really value the peace of mind of delivering the body myself and having direct contact with the person who was handling the cremation process. I valued someone who made the grieving process easier to manage. 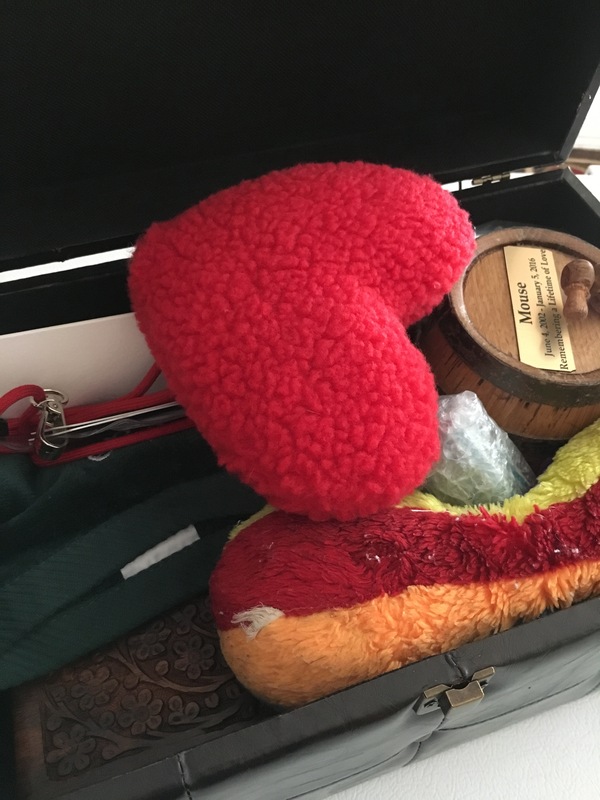 When you lose a beloved heart dog, the last thing you want to do is worry about the handling of the body and when you would get the ashes back. In my case, the ashes and memory box were ready to be returned within 48 hours. 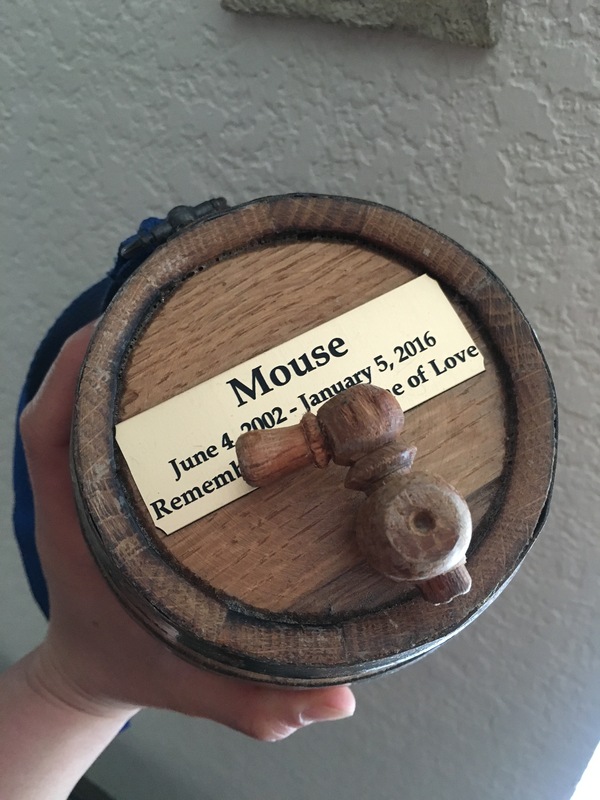 I also left an urn that was filled and decorated with an engraved plate for my convenience. This is our custom art from Breakfast Jones on Etsy. 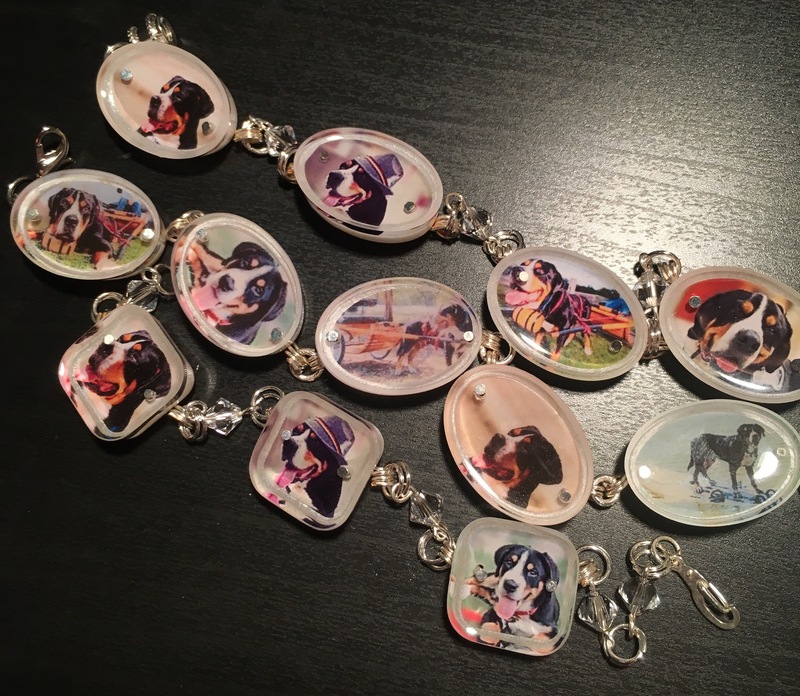 Beautiful bracelets commissioned by a dear friend and created by Memory Charms by Ellen. Book - Heart Dog: Surviving the Loss of Your Canine Soul Mate by Roxanne Hawn. I got this book before I needed it, and it was great for setting up the infrastructure for what you need for grieving. Memory box ideas - There are various places to find a suitable memory box. I looked for several to house all of the dog's items in addition to the ashes. I love this one on Etsy with a glass wave. You can also find some beautiful boxes on Hobby Lobby, or even Amazon and Ebay. Try searching keywords: memory box, cremation box, or trunk. There's really no limit on where you can find a box. Get creative. Jewelry - There are many artists who can infuse ashes into jewelry, and the options are endless. Here's one that I like that has the options of coloring the ashes and engraving the inside. This seller, ClosebyMe, is also highly recommended by many other pet owners. Most of these options are very affordable options for beautiful pieces. For most of these, the artist will ask you to send some of the cremation ashes via mail to make the piece. 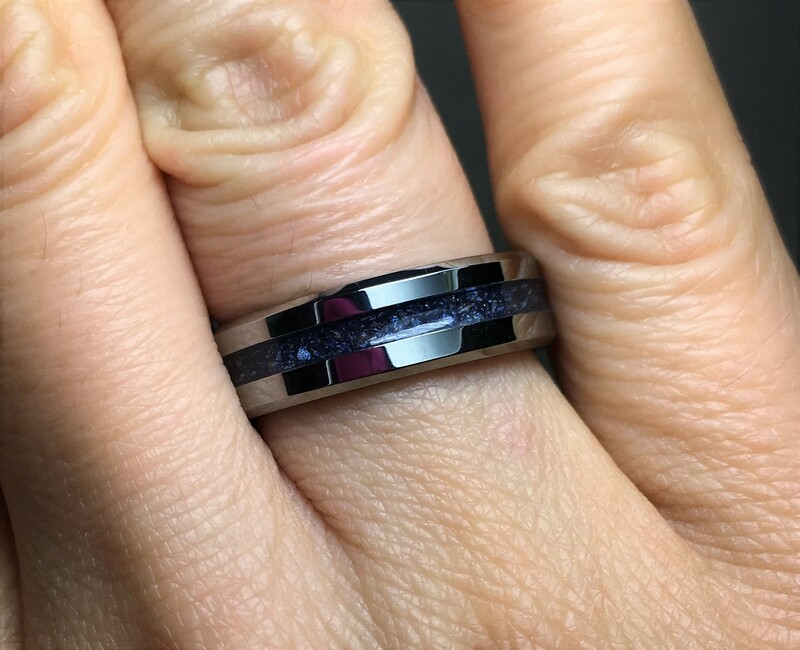 This is the ring I chose on Etsy. I added blue on the ashes and engraving. Memorial Items - I've found a few items that I really love on Etsy. There are too many to list, and these are just my personal favorites. The 3D ocean wave, the globe, and a hanging glass ornament are all on my short list. Like the jewelry, the artist making cremation pieces will ask you to send some of the cremation ashes via mail to make the piece. I used this keg as an urn. Mouse carried this keg around during his therapy dog visits. 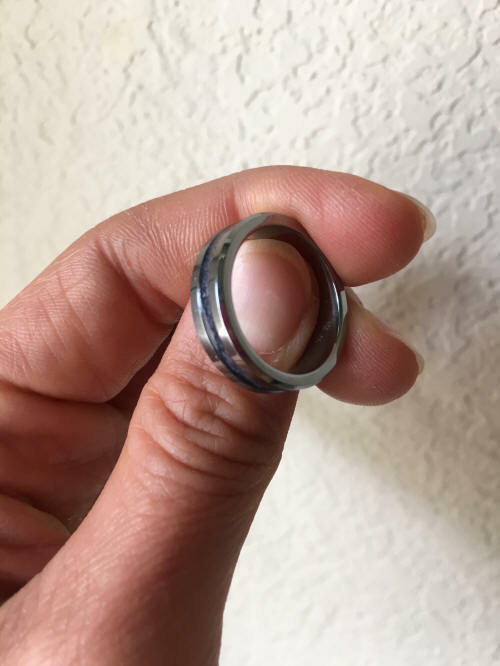 I wanted a cremation ring, and I looked through 100's of options before settling on this one. It is a heavy duty ring at 6 mm in width. Here's the link to the one that I bought pictured above. Close up of the ring. I bought a shadow box for odds and ends. I do keep finding things to add in here. 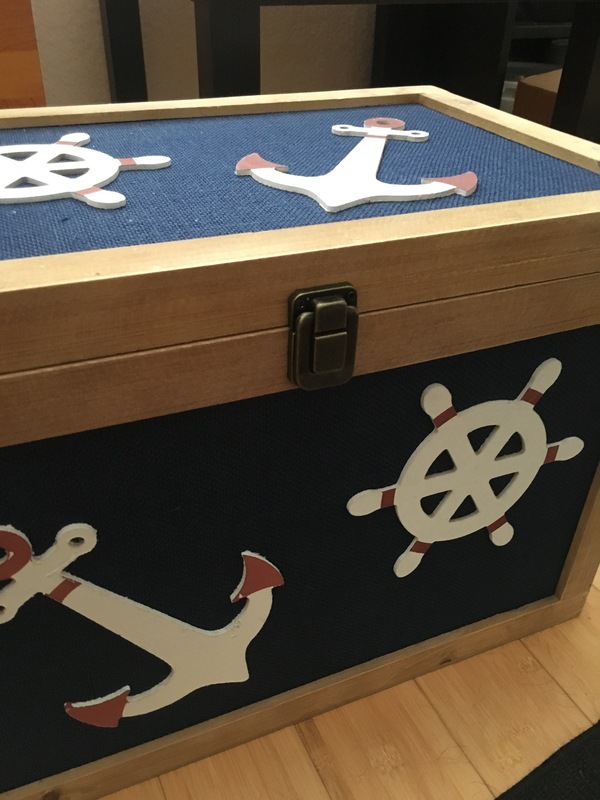 I got this wooden box at Hobby Lobby, and the nautical theme was perfect for Mouse, the water rescue dog. Here's the inside of the box. 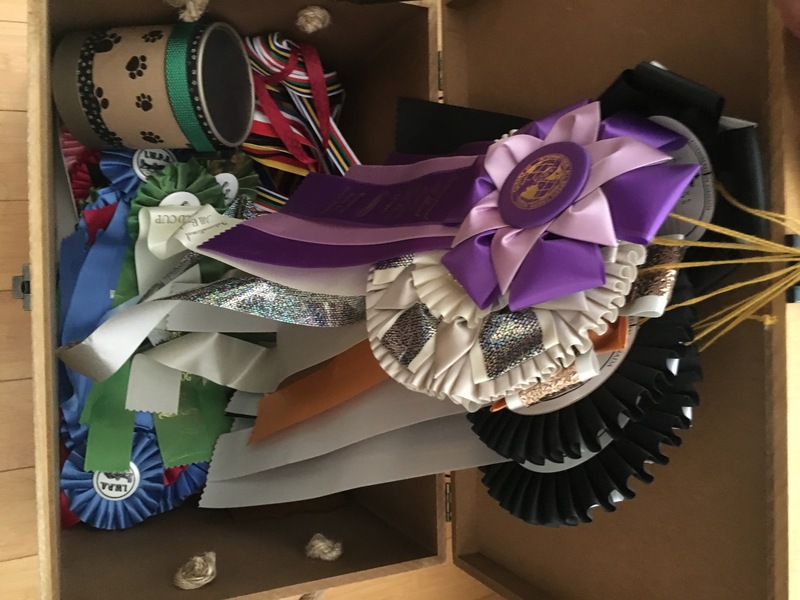 This one is primarily ribbons and trophies. Here's another box I picked up at Hobby Lobby. 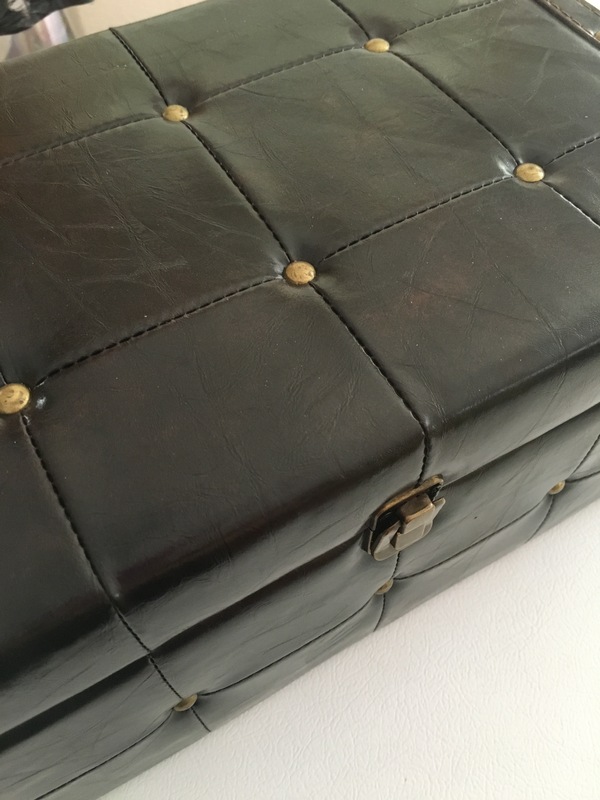 It is a beautiful faux leather box. This box contains his ashes and keepsakes.